A couple of weeks ago I had what I like to call a 'Charlie Bucket' moment. But before I go any further, perhaps I should explain exactly what that is and in order to do so we need to cast our minds back to the final scene of that camp and slightly sinister classic from 1971, Willy Wonka and The Chocolate Factory. Willy Wonka, Grandpa Joe and Charlie Bucket have just miraculously smashed through the glass factory roof in a glass elevator and are flying through the air, surveying the wonderful Bavarian scenery below. After a short period of uplifting violins and wonderment, Willy Wonka (or Gene Wilder rather) then delivers his coup de theatre, revealing that he wants to pass on the chocolate factory and all that it encompasses to Charlie Bucket. For me this is the pivotal point of the film. Because the look that Charlie Bucket shoots back at Willy Wonka is truly, a thing of beauty. This simple, well executed look symbolises in one short, sharp hit the realisation that after a lifetime of poverty, desperation and grime, everything is finally about to change. It is both glorious and heartbreaking to watch and why child actor, Peter Ostrum didn't get any work after that film is beyond me. So, simply put, a 'Charlie Bucket' moment occurs when all your dreams come true. My CB moment happened in Porterford Butchers and fellow blogger MiMi from Meemalee's Kitchen was my very own personal Willy Wonka. I had heard her talk about this butchers on Watling Street before, wittering on about buying 'bags of meat' but I always assumed MiMi was just getting her protein haul in for cooking in the week ahead. The carnivorous chanteuse that she is. But then I met her recently for lunch and she suggested that we get a bag of meat to eat. This was a curious proposition and I have to say I wasn't quite prepared when I walked in through the door of Porterford Butchers that day. Standing behind a winding queue of city gents, the shop itself seemed fairly regular as we slowly shuffled past a respectable display of joints and meats but then the suits fell away and I found myself basking in the warm glow of halogen lamps. The sight in front of me was one to behold and took my breath away. A cabinet jam packed with endless varieties of cooked meat. Sausages, chops, ribs, steaks, breasts, legs, kebabs, you name it, it was there. And the only concession to your five-a-day was a tray of sticky looking roast potatoes. I looked at MiMi with a tear in my eye and she just put her hand on my shoulder, offering warm support. The guy behind the counter then chirped up in brusque fashion, asking "what would you like sir?" Mindful I think of the growing queue behind me. "When can I move my family in? ", I replied. Which prompted a frown from said guy and a jab in the side from MiMi. "I'll have two ribs, two sausages, a jerk chicken leg, a minted lamb chop and some roast potatoes please." And he duly handed it all over in foil-lined bag. I had just bought my first bag of meat. Naughty, delicious, guilty and salty but after scoffing the lot, it felt like I was on top of the world. You should go, you might get to feel like Charlie Bucket too. Some of the photos are courtesy of MiMi. O.M.G. Am now sitting at my desk drooling in a very inelegant fashion (not that there's really an elegant fashion in which to drool). I am THERE. In fact I may never eat anywhere else, ever again. GIVE ME MEAT. How can you go from never having heard of a bag of meat to desperately coveting it in 1 minute? I feel like Zaphod Beeblebrox first sighting Hotblack Desiato's ship. 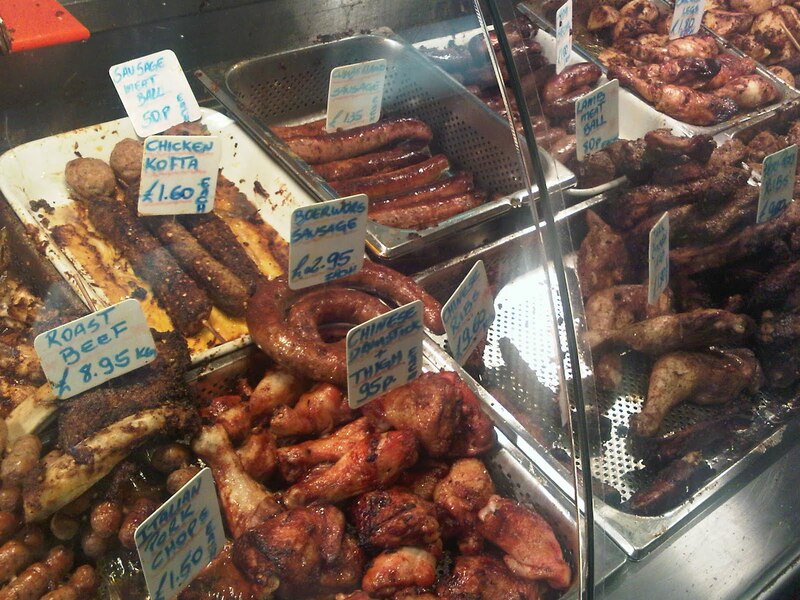 This is why I miss the North sometimes, every butcher has a hot meat counter. Even Morrison's had it's own hot sticky meat counter a mile long! Aw bugger. I could only think of a very loud O.M.G. then Hugh beat me to it. What a find. You Mimi and me need to do a meat lunch picnic sometime, ok? Please? Foodcat - it makes you that excited eh? Pavel - I was going to add that the offerings you see in some supermarkets doesn't compare but I can imagine Morrisons putting on a fine spread. Man, the queues are going to get worse, aren't they? Dude, this place looks amazing!! I WANT MEAT NOW! @LucMartin - you've got a lot of meat coming you way old boy, don't you worry. Craftilicious - whereabouts are you then? Want me to post a bag of meat? Actually that might not be a good idea. Bribedwithfood - I can just picture you now, wandering aimlessly around the street of Green Park, muttering "Meeeeeeaaaaat"
Meemalee - we're going to need to get there earlier. I SO love this butcher. I used to work across the road from it and it was always my port of call on a Friday for 8 chickens and 24 steaks for about a fiver. And they always complimented me on my (frankly excellent) hair. I miss Bank. Stupid, stupid Holborn Viaduct. I need to get to meat land. Heeelllllpppp! 'Bag of meat' I need this in my life. I miss working in the city soooo much. Lovely shopfront on the butchers btw. So, just out of interest mate, how much did it cost? 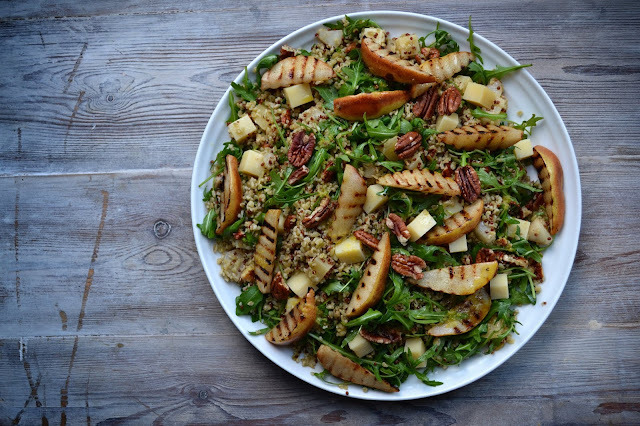 a rare treat, or more of an everday lunchtime meat fix? @Dan - You can see the prices in the counter pics eg 95p for a fat chicken drumstick, £1.50 for a pork chop. 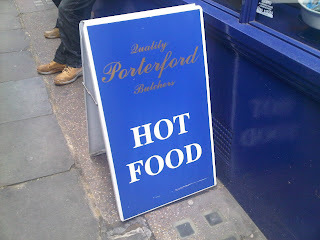 If I lacked restraint, I would be eating there every day. Hahaha how I love and will miss London for discovering stuff like this! How brilliant! And good to see Mimi leading more fellow foodies astray. She's the pied piper I say and long may she reign. Your stories always make me laugh. I do love a bag of meat! 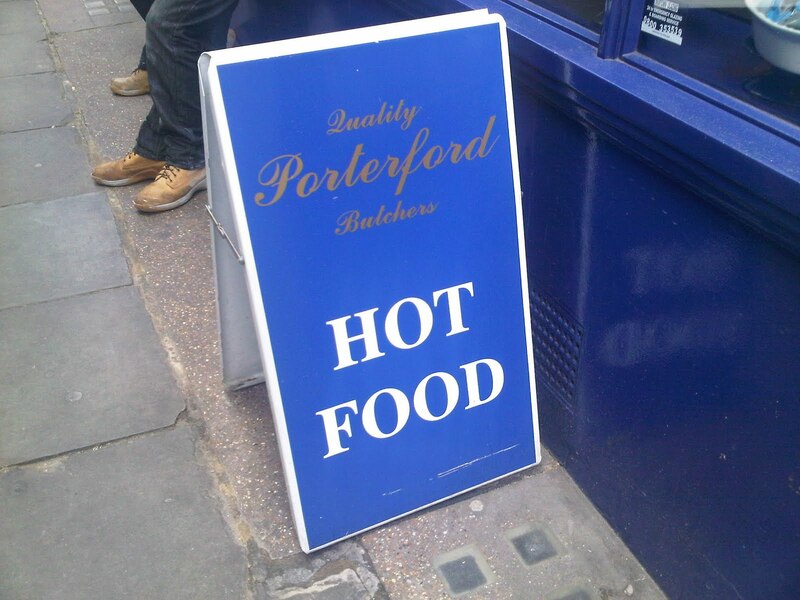 hi i work i the city of london and the only reason i enjoy going 2 work is 2 go and get my lunch at porterford butchers at watling street they sell gr8 cooked meats but i dont like the man with the white beard coz he is very rude and i think they should sack him if they want more custom.